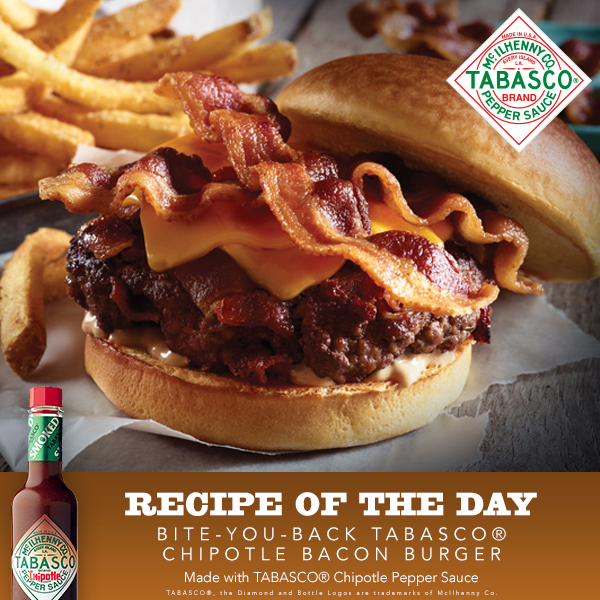 Celebrate Burger Day with the Bite-You-Back Tabasco® Chipotle Bacon Burger! 1. In a large bowl combine beef, bacon, onion, TABASCO®Chipotle Sauce, garlic, and breadcrumbs, mix until thoroughly blended. 2. Shape into 6 patties. 3. Grill over medium high heat or broil until desired doneness, about 5 minutes per side for medium. 4. Serve burgers on rolls with lettuce, tomato and onion.